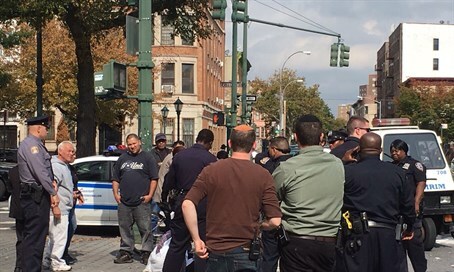 Black man believed to be on drugs pummels Jewish man in his 40s on main thoroughfare in Crown Heights. A Jewish man sitting on a bench on a main Brooklyn thoroughfare was attacked on Tuesday afternoon in an unprovoked, and possibly anti-Semitic, assault. The attack occurred at around 12:00 p.m. local time (7:00 p.m. IST) on Eastern Parkway between Kingston and Albany Avenues in the Crown Heights neighborhood. The victim, a Jewish man in his 40s, was sitting on a bench talking on his cell phone when a black man suddenly began to beat him. Bystanders on the scene quickly intervened, eventually subduing the assailant at the intersection of Albany Avenue and Eastern Parkway. A number of volunteers from the Shomrim neighborhood watch group also arrived on the scene and contacted police. The victim was lightly injured but did not require medical attention. His assailant freely admitted to the attack claiming to be under the influence of drugs; police at the scene declared they were taking the suspect to a psyche ward. New York City has seen an upswing in anti-Semitic incidents in the past few weeks; last Friday, a firebomb was thrown at two Israeli yeshiva students visiting Manhattan. Over the Jewish High Holidays in September, two Orthodox Jews were attacked by assailants with BB guns in Queens.